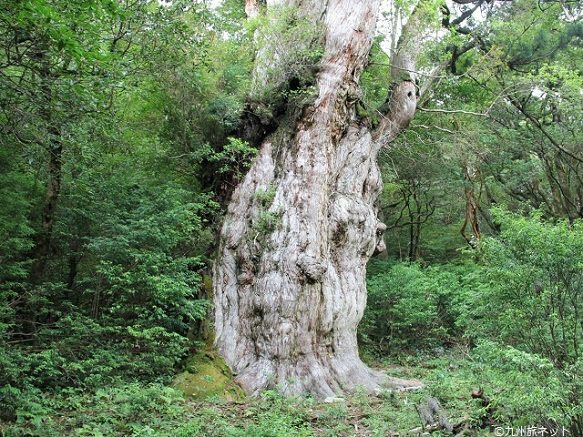 The oldest tree in all of Japan stands here at Jomonsugi in Yakushima. 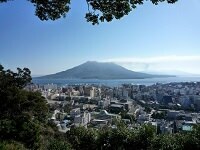 Named after the Jomon Period (14,000-300 BC), the Jomonsugi is estimated to be 2000 to 7200 years old. It stands at just 25 meters high but the trunk is approximately 5 meters in diameter. 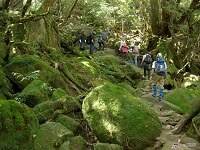 Along the trail to see Jomonsugi are several other historical trees including Wilson's Stump and Meotosugi. Wilson's Stump is the hollowed out remains of a giant cedar which is estimated to have fallen over 300 years ago. 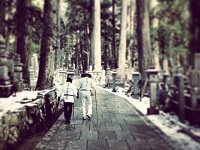 Meotosugi is a uniquely structured tree which seems to resemble a husband and wife embracing. Hiking through this trail is quite intense: it takes about ten hours round trip and although the first part of the trail is relatively smooth, the second part is more steep and the paths consist of more dirt footpaths. To accomodate for the long trails, there are a few huts where you can stay overnight to rest up for the next day's hike. Proper hiking gear is required and hikers should not only have good ran gear and hiking boots but also must bring their own toiletries and water.